However, downhill welding can inhibit penetration and generate slag inclusions unless a welder can control the arc to track correctly on the welding line at fast speeds (e.g. 60 cm/min or higher with a l.2-mmØ wire). The following measures can prevent defects in vertical fillet downhill welding. (1) Use the straight run technique without weaving. 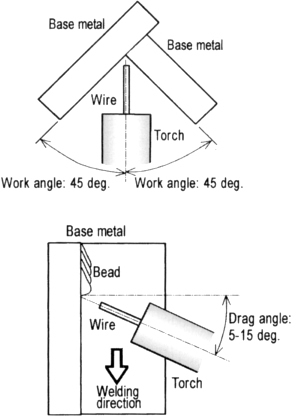 (2) Control the welding torch so that the work angle is 45 degrees and the drag angle, 5-15 degrees as shown below. 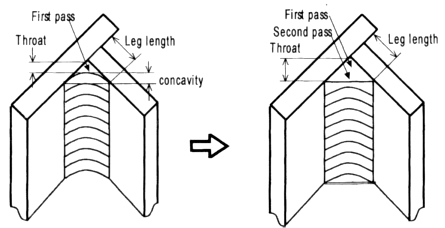 Another difficulty with downhill welding is that it tends to cause a concave bead having an insufficient throat (concavity) in vertical fillet welding. To overcome this problem, two-layer welding is recommended as shown in the following figure. Even in the second layer, again, use the straight run technique without weaving. With respect to welding wires suitable for downhill welding, the following choices are recommended in conjunction with suitable droplet transfer mode and application. Before employing downhill welding, weld penetration, joint alignment tolerance and the welder's skill should thoroughly be examined to ensure that the weld satisfies the requirements. For your information, AWS D1.1 (Structural Welding Code ― Steel), for example, specifies that a change from uphill to downhill or vice versa is the essential variable requiring requalification of the welding procedure specification.